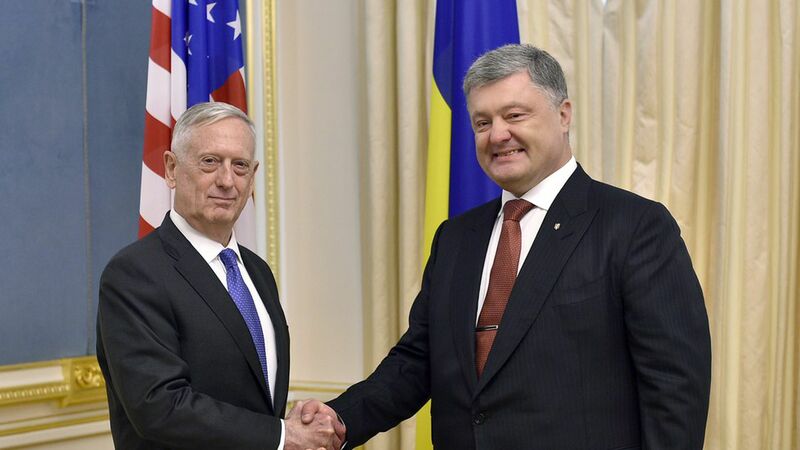 Defense Secretary Jim Mattis said the White House would continue to support Ukraine against Russian aggression during a Thursday trip to Kiev, per Reuters. "Despite Russia's denials, we know they are seeking to redraw international borders by force, undermining the sovereign and free nations of Europe," Mattis said. Mattis also made clear his personal support for outfitting Ukraine with weapons, a move that President Obama's White House feared would escalate the situation. He added that Trump has not yet decided on the issue of providing weapons. Why it matters: Ukraine has long relied on the U.S. as backup against Russia, but Trump's comments on the campaign trail — when he told ABC, "...you know, the people of Crimea, from what I've heard, would rather be with Russia than where they were. And you have to look at that." — have sowed doubts for Kiev.